"The greatness of LaFaro is reestablished here as he once more excels in the trio format. In this context, it's possible to further appreciate LaFaro's improvisational skill and full bass sound ... in his short life, he had so much to say, it's very fortunate to have another recording to add to his legacy." "... LaFaro made such an impact on the modern jazz world that his groundbreaking techniques on the upright bass are the measuring stick to which others are held ... five intriguing performances with his own trio ... any fan of the jazz bass needs to invest in this indispensable dissertation on one of the craft’s true masters." "Four Stars ... LaFaro’s freewheeling, harmonically advanced bass style ... opened a door to a wholly new approach to the instrument that influenced a generation of players who followed in his wake ... (the archival tracks) display LaFaro’s rich, woody tone and steady, unerring pulse as an accompanist ... LaFaro turns in some incredible solos ... which highlight his melodic ingenuity along with his uncanny speed and facility on the instrument. And his ability to spontaneously and effortlessly interject contrapuntal ideas against the flow of each piece marks him as a revolutionary accompanist in a piano trio setting." 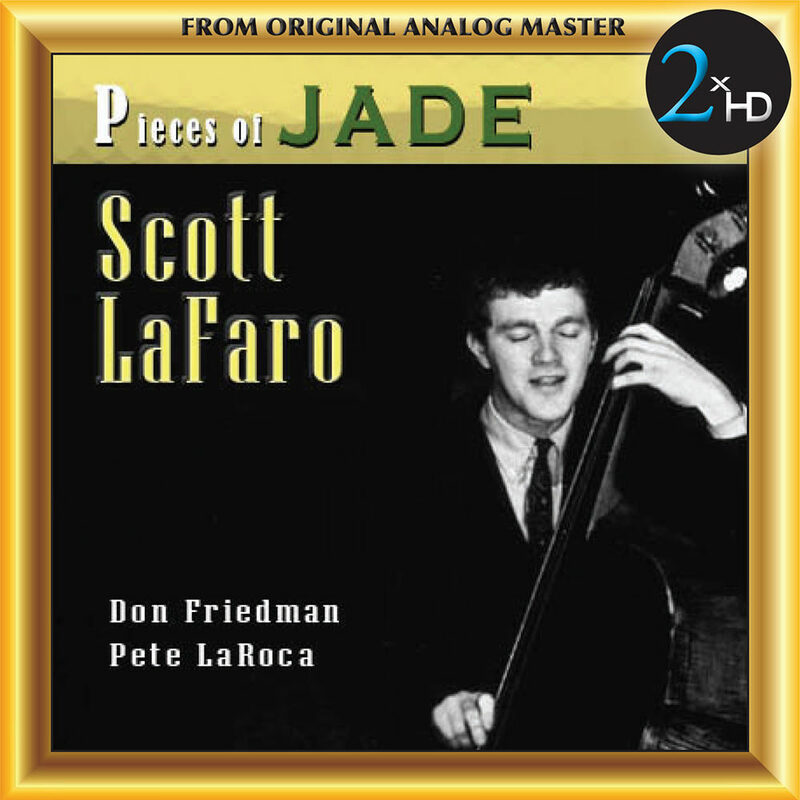 Scott LaFaro's Pieces of Jade features long-lost material recorded in New York City shortly before the bassist's death in a car accident in 1961. LaFaro and his stellar bandmates pianist Don Friedman and drummer Pete LaRoca run through four jazz standards, including two takes of Sacre Bléu. The album concludes with excerpts from a 1966 interview with Lafaro's earlier colleague Bill Evans. "His approach to the bass ... it was a beautiful thing to see ... he was a constant inspiration." Mastered by 2xHD, a record label which uses its proprietary system to process music masters originally recorded in analogue or DSD or other format, to DSD in order to produce a unique listening experience. The process uses a selection from a pool of high end audiophile components and connectors. In some cases even using battery power, so as to benefit from the cleanest power source possible. This variable equipment combination custom tailored to each project, creates the most accurate reproduction of the original recording, unveiling information previously masked by the use of EQ, transformers, patch bays, extended cable length, etc. The selection of components is critical, as many A/D and D/A converters are unable to pierce through these filters that create a veiling effect to the sound. The 2xHD system preserves the dynamics of the original master and proves an open feeling to the sound.